PDF to Word online: Edit PDF files for free with Word! 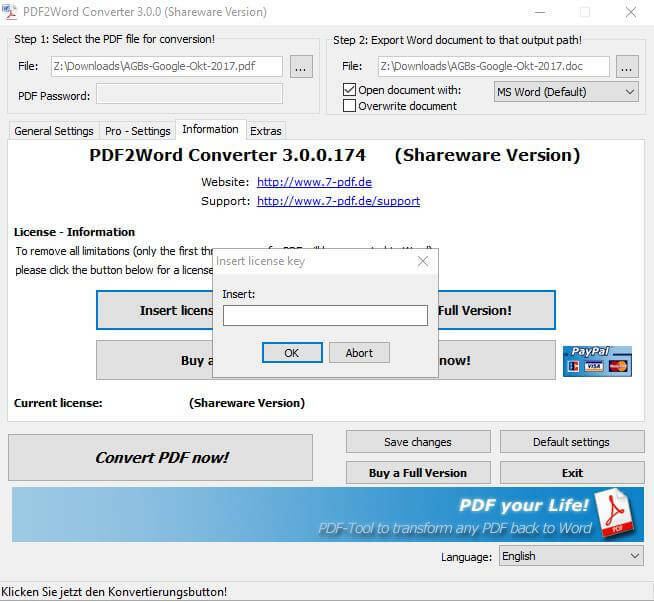 To give them a safe alternative, we have also developed our PDF to Word Converter as a Windows application for the reasons mentioned above, which works completely offline and gives you the necessary security that your data, files and documents remain on your system. 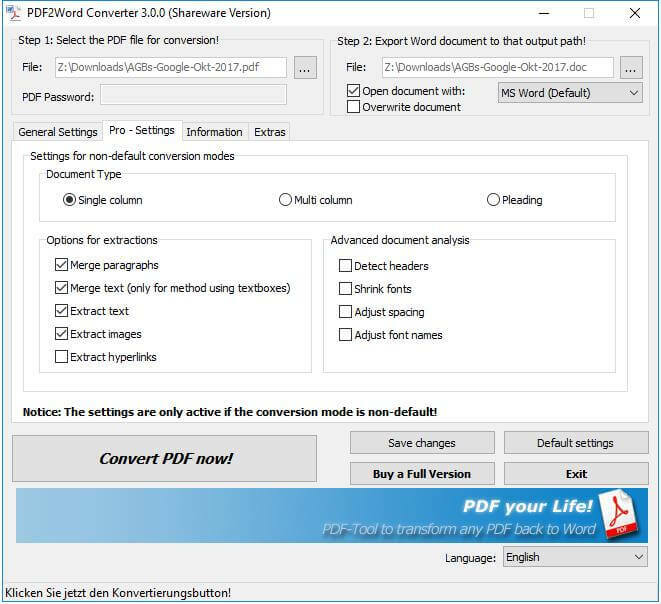 Once installed, you can always use the PDF to Word Converter offline safely and anywhere without having to be online. No personal information in the PDF document is available to anyone except them. No personal information in your PDF document are available for anyone except them you. We personally have nothing against Online PDF Converter on the web, but you should remember that data may be transmitted unprotected and could reach third parties. Be it a vulnerability on the pages of the PDF to Word Online Converter or by third parties that could be supplied with data. We find that a certain degree of security is only given if, as far as technically possible, data is processed independently of the web, be it to convert PDF content into Word, or to process PDF documents. It is clear that no system or application can promise 100% security, but with some measures, even as a user, you can minimize the risk as much as possible. Documents and data processed should stay on your PC or not? That's why all our programs are offline. So do not fret over upload limits in PDF to Word Online converters, slow internet connections, a currently unavailable online PDF conversion portal, a missing internet connection because you're on the train, or possibly broken converted Word documents sent back to you. Being offline saves your nerves, is safer and works on your system always and at any time. Have a secure feeling! Download our PDF to Word converter today and save yourself the need to convert PDF to Word online. 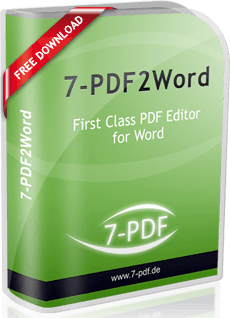 You can download and install the free shareware version of our PDF to Word Converter "7-PDF2Word" from our website. The software converts the first three pages of a PDF document to Word for free. 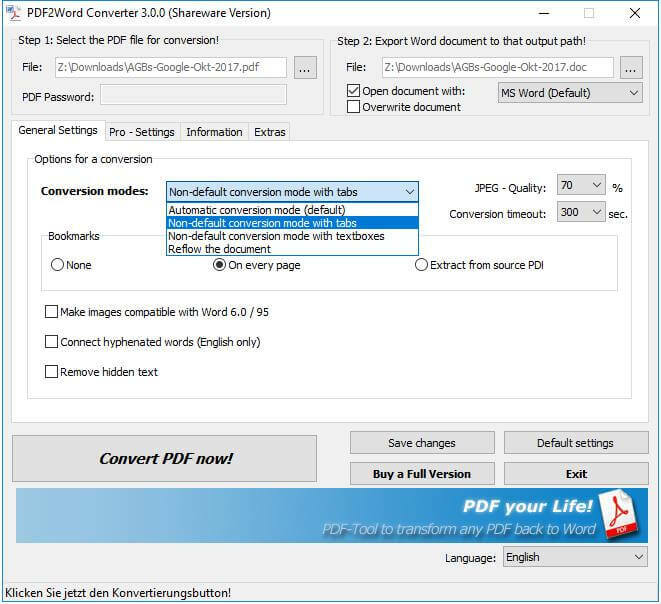 If you want to convert more extensive PDF files with our PDF to Word converter, we recommend the full version of the program. The full version costs an affordable, one-time license fee (no subscription) and can be used for lifetime, that means future new program versions can always be unlocked and used as a full version with their once purchased license key. It is important that the fonts used in the PDF should be available on your system and that it is not a ScanPDF or that the PDF is in a page format that is not compatible with Microsoft Word. This ensures that your PDF layout is preserved in Word. But in most cases this should be the case!